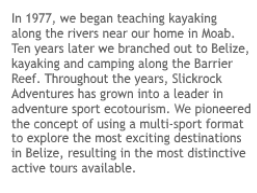 Slickrock Adventures has specialized in whitewater kayak trips since its inception as a kayak school in 1977. 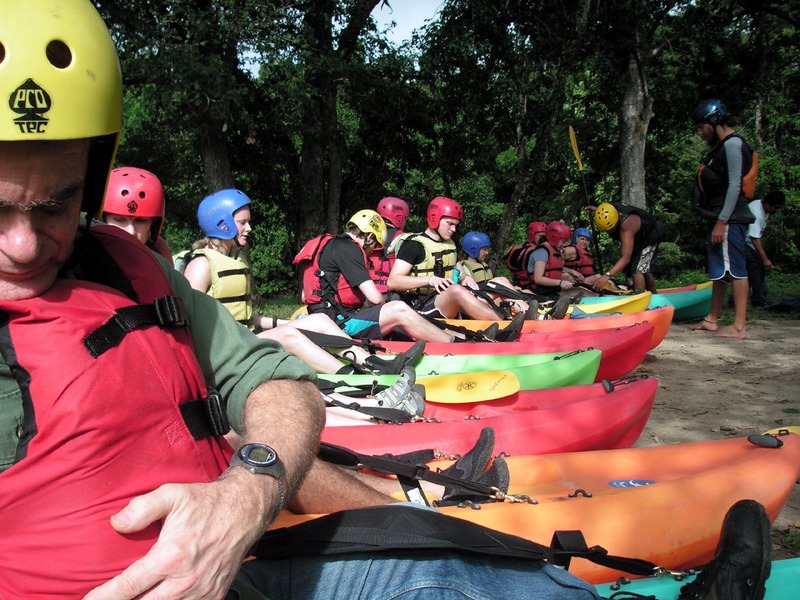 Today that tradition continues with our kayak trip down the Mopan River in western Belize. 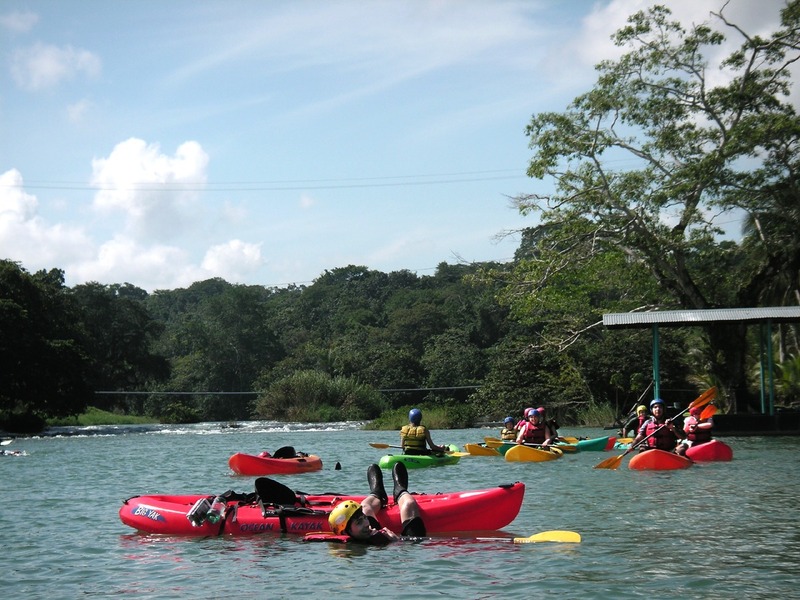 We run the Mopan River as part of our Belize Adventure Week multi-day trip. This full-week adventure tour includes this whitewater trip, along with other activities such as Belize cave kayaking, waterfall rappelling, ziplining, exploring a Mayan ruin, and three days on our private island for sea kayaking, snorkeling, scuba diving, kitesurfing, windsurfing, kayak surfing, sport fishing, kayak fishing, paddleboarding, and board surfing. Of all of the all-inclusive Belize trips available, this adventure package is a must do! 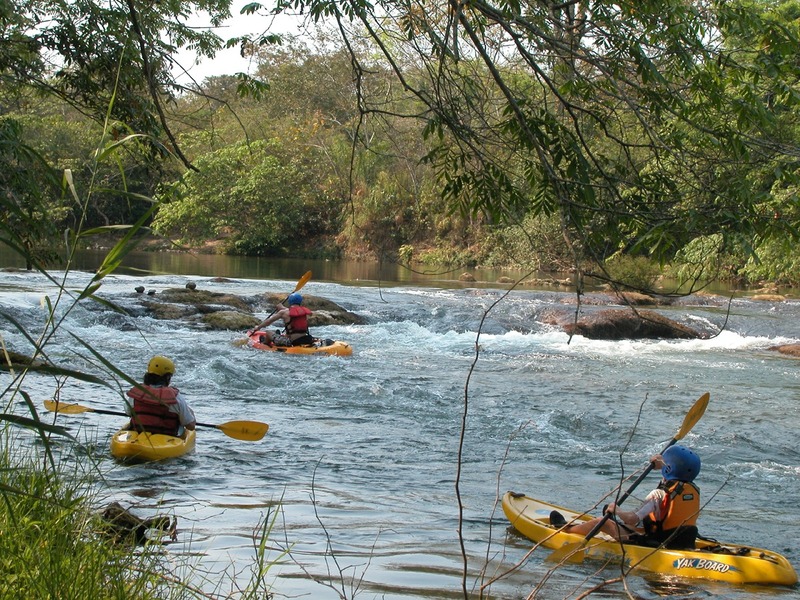 This Mopan River kayak run is also available as a one-day trip for groups of minimum 8, with a maximum of 14. The Mopan and Macal Rivers flow together to form the Belize River, one of Belize’s major rivers. Our run down the Mopan consists of 5 miles of the river as it passes through the end of a gorge into the valley below the Maya Mountains. The river’s warm, 70 degree water is a beautiful clear green color and the channel is surrounded by huge trees teeming with parrots and iguanas. 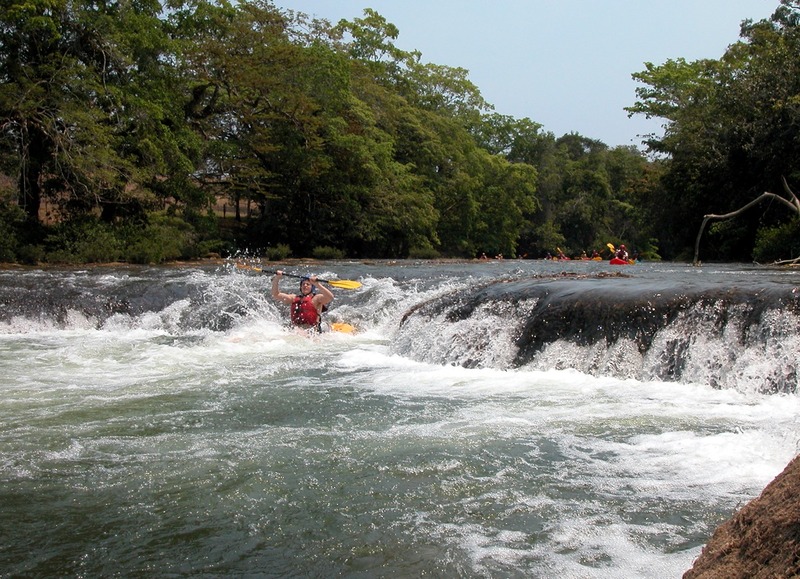 The rapids we encounter are an easy level with large pools at the end of each drop. 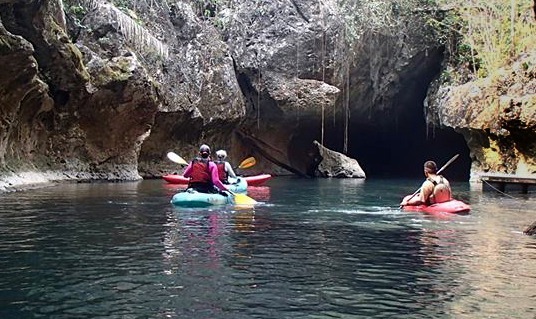 If you are looking for more tours run as day trips in Belize, visit our Caves Branch River page. 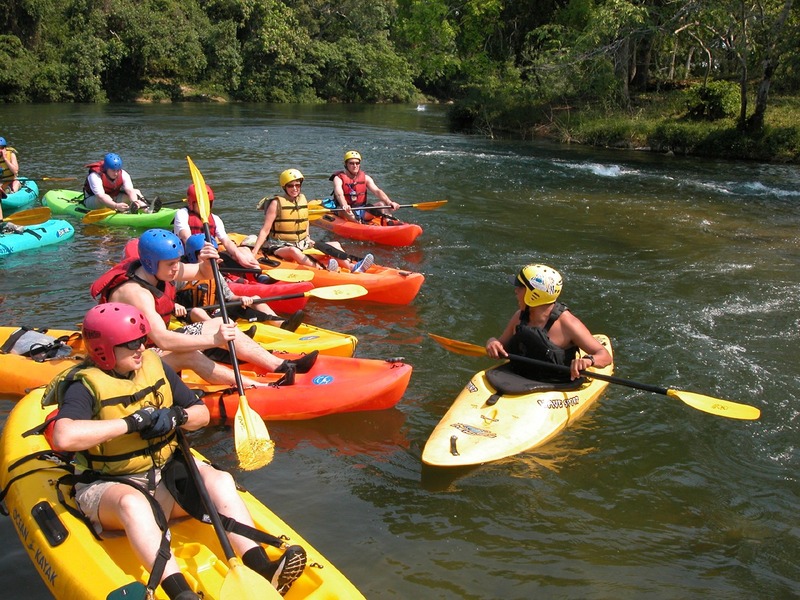 This one-day river tour is available only for groups of 8+ booking together, maximum 14. We do not sell this package to individuals. If you don’t have a group of eight, you can sign up for either the full 8-night Belize Adventure Week package or the half week 4-night Belize Adventure Week package. 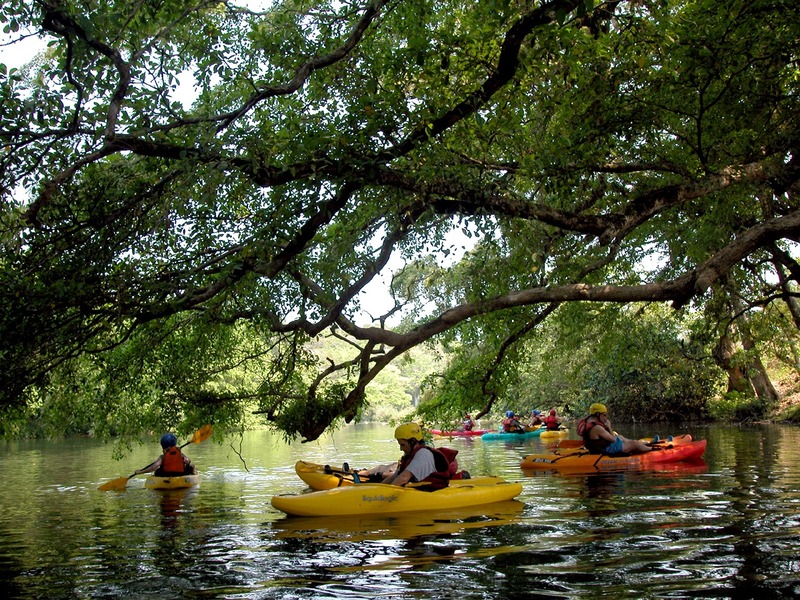 We run the Mopan River on Day Three of this adventure itinerary. Group size: Minimum 8, maximum 14. When available: Wednesday, Thursday or Friday only, Dec – April. Please inquire for availability. Cost: $195 US pp, includes pick up and drop off in Belize City and lunch. No group discounts available. Deposit: $75 deposit pp (8 minimum) is due to confirm your space. This deposit is non-refundable. You may make your reservation by telephone, fax, mail, or e-mail. Checks, money orders, VISA, MasterCard, Discover, and American Express are accepted for all payments. The balance is due 60 days prior to departure. 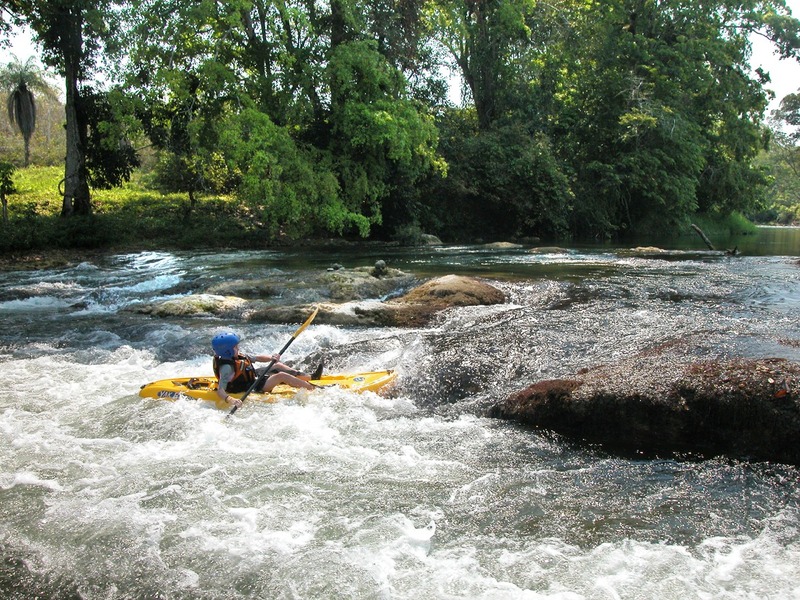 For families: We use whitewater, sit-on-top kayaks for everyone. The youngest person who may paddle themselves in a kayak is a 10 year old. If the water is too high to run the Mopan safely, we reserve the right to substitute another river of our choice on the day of the trip. Using modern sit on top kayaks designed for whitewater, our groups begin the trip with a thorough instructional class in kayak technique. This covers basic strokes, familiarization with balance and recovery methods, reading the river currents, and getting comfortable in moving water. No experience is necessary, but you do need an adventurous spirit. 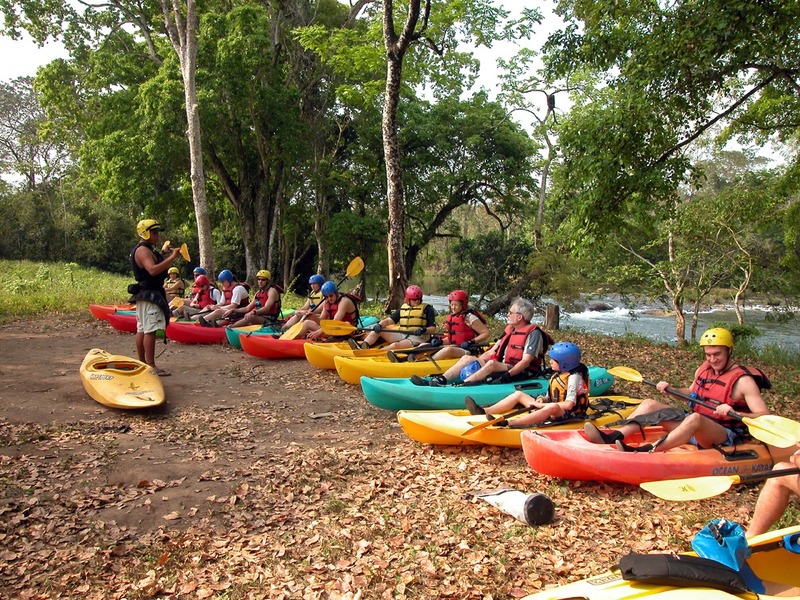 This is a great way to get to know the rivers of Belize! Instruction begins on shore. 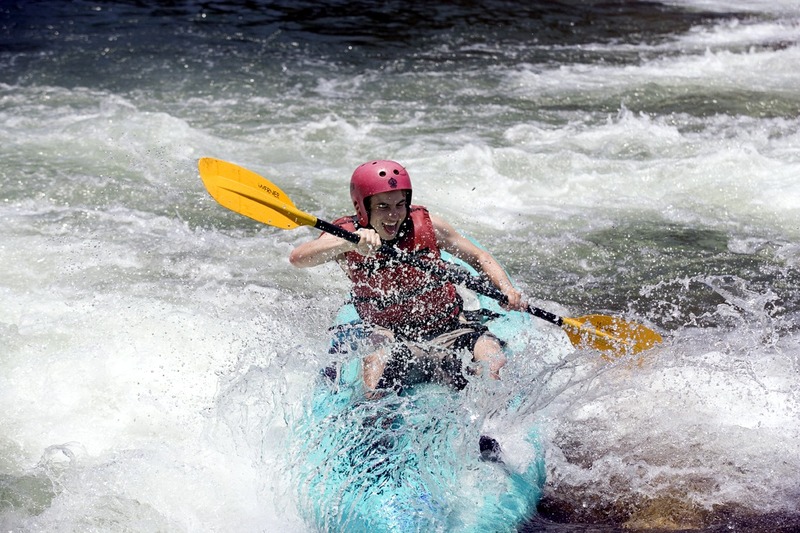 Once underway down the river, we encounter numerous rapids (Class I and II) with large pools between drops. Passing several villages, we continue to run exciting rapids in our highly-maneuverable kayaks. We learn to surf waves, make eddy turns, and even try some ‘pop-ups’ in the bigger drops. Abundant birdlife is seen along the lush river banks, and huge iguanas perch in the tree branches that overhang the river. After a reservation is made: A Registration and Waiver of Liability Form is sent. The completely filled out form and the final balance is due 60 days prior to departure. Cancellation policy: No exceptions are made to our cancellation policy for any reason. Your deposit of $75 pp x 8 persons is non-refundable. If we receive notice of cancellation 59-30 days prior to departure, 50% of total group trip cost will be retained. If we receive notice of cancellation 29-11 days, 75% of total group trip cost will be retained. ; if notice is received within 10 days of departure, no refund will be given. Unused services: No partial refunds or credits will be given for unused services such as meals or transport. Our trips are quoted as a package; credits are not given for services not used. No refunds will be given for any reason once the trip has begun. Late arrival or departure: Any conditions out of our control that delay your arrival or departure may add to your cost; all extra charges caused by delays (catching up with a trip in progress) or any variations from the itinerary (early departure, evacuation) will be at the customer’s expense. Slickrock reserves the right to sell additional seats up to the 14 maximum to others who might want to join this tour.